The YMCA is an essential, integral part of my life in terms of good self care and exercise. It is so important that I have a place to come and de-stress so I can do the work I do as clergy. Everyone who knows me knows this is my happy time. Everyone in my family and in my parish knows. Whenever I travel I go to the YMCA and just show my Rye Y card and sometimes pay a nominal fee. I recently got married so my name has changed from Betty Griffin. 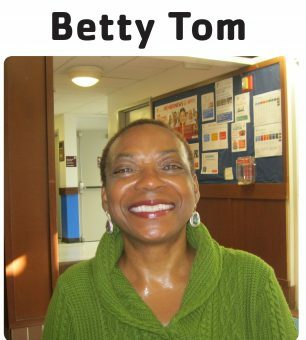 Now I’m Betty Tom. My husband is also clergy and our friendship turned into a romantic relationship so I’m really happy. I’ve become more intentional about financially supporting the Rye YMCA’s work in the community. I know how important it is. The thing that really made me want to give more was seeing the program guide and all the activities the Rye Y is doing for the community, particularly for children. In the last two years we’ve made supporting the Rye Y a priority. When you really care about something you don’t mind. Summer camp and the LIVESTRONG at the YMCA program are so important. The scripture says “Where your treasure is, there your heart will be also.” Where your heart is, you put your money and your time. My heart is here. I love that the YMCA stresses diversity and is a place where diversity is honored. One of the members I’ve met here is Jewish and we enjoy sharing our interfaith experiences. My Hispanic friends are teaching me Spanish. People say, ‘how do you fit in exercise?’ You make it a part of your life. You don’t fit it in, it is part of who you are.